Marketing is all about personal connection these days. Customers follow their favorite brands on social media, chat with friends about product recommendations and expect interaction when they post or comment. Recruitment marketing is no different. Earlier in this series, we talked about how to target your audience, plan your recruiting strategy, and fill your toolbox with the right recruiting tools. In this final post, we’ll look at how personalizing the candidate experience can push you light-years ahead of your competition when it comes to attracting, engaging, and retaining top talent. Which would you rather receive: a general mailing or a personalized offer? Most of us want the personalized offer because it shows that a company has taken time to understand how we buy and what interests us. It’s getting harder and harder to make an offer stand out amid the onslaught of advertising these days, but personalization is one of the best ways to do it. And that’s true when you’re recruiting as well. Today’s job seekers have more opportunities at their fingertips than any previous generation of workers. So how can you make sure the right people know about your open position? 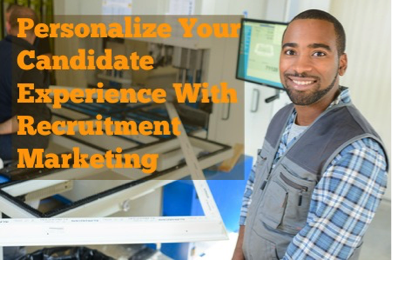 Personalized recruitment messaging cuts through the noise and seizes the attention of your prospective candidate. Brand—Develop your employer brand with a compelling message that speaks to the kind of employee you want to attract. Consider your value proposition carefully and think about why your ideal candidate would want to come work for you. Then weave that message into your website, career page, and job postings. Analyze—Use data and predictive analytics to learn about candidates. Where do they go for job information? What kinds of tools do they use? What motivates them? Segment—Just as you segment your customer audiences based on their interests and behavior, you can and should segment your candidate prospects based on the type of job they do. The messaging you develop for executive candidates should be different from the ones you create for IT personnel or sales associates. You should also develop different messages for candidates at different stages in the recruitment process. Connect—Launch targeted initiatives to reach different kinds of candidates such as veterans, diversity candidates, and college grads. Connect with them through networking opportunities, social channels, and referrals. You can also reach out directly to promising candidates, even if they aren’t actively job seeking. Engage—Once you have made the initial connection, find ways to establish ongoing interaction through social media, email, or follow-up phone calls. You can also create a jobs newsletter or social page so candidates can receive information about open positions as they become available. If all of that sounds like a lot of work, don’t worry. You don’t have to implement every idea at once. Start small, choose one area to work on, and develop your full-blown strategy over time. And if you don’t have the time to handle recruiting yourself, don’t be afraid to ask for help. Your PEO has many resources available to help you create and manage your recruiting program. From sorting resumes to screening candidates to setting up interviews, a PEO can shift the administrative burden of recruiting off your shoulders so you can focus on developing your core team. You still control the final hiring decision, so you can make sure the candidate will be a good cultural fit in addition to bringing the right skills and credentials to the table. Ready to partner with a PEO? Use our PEO matching tool to find the right provider for your specific needs!